Social media automation provides marketers with a set of technology services and tools to automate social listening, posting to networks, and scheduling recurring posts. Marketers can choose from semi-automated to totally automated solutions ranging in cost from free to thousands of dollars per year. If you’ve read other articles in the #MartechMonday series, you’ve likely seen several positive mentions of Zapier. For example, in this DIY Guide, I show Hubspot users how they can set up sales alerts in Slack, via Zapier. One other integration solution that I haven’t written about before is IFTTT (short for “if this then that”). This powerful integration solution entered the martech scene in 2011. At the time of its birth, it was a very consumer-focused solution and was famous for helping people automate their homes through “recipes” where it would take one piece of technology and help it talk with another piece of tech. One of the most popular recipes was connecting a Wemo smart plug (connects a standard lamp to the internet) to your phone so that you could turn on a lamp in your home from anywhere in the world. For years IFTTT was seen as a consumer product, with little applicability to businesses. However, that has changed considerably over the last year as IFTTT has relabeled its recipes as “applets” and has moved to more of a competitor role with Zapier. 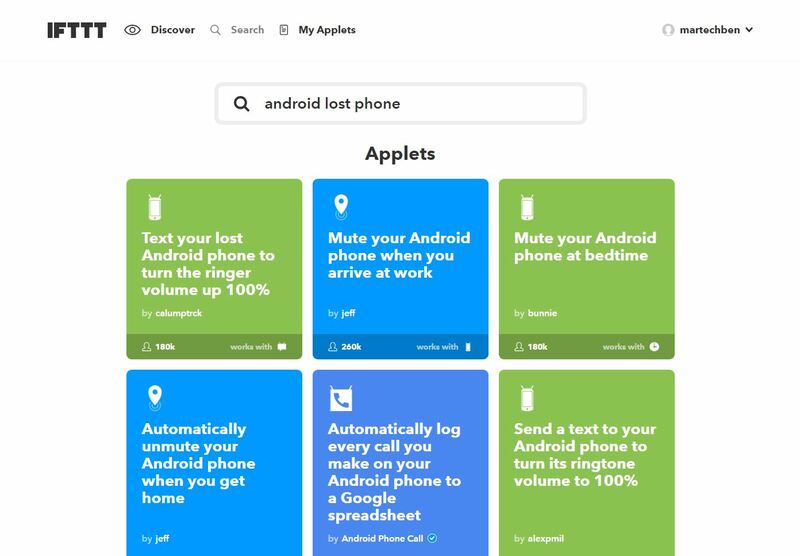 In fact, IFTTT has more than 14 million applets available to you. This means there are 14+ million unique combinations/pairings of technology that you can easily create with IFTTT. One area that IFTTT does equally well, if not better than Zapier due to its consumer-focused ease-of-use, is in the automation of social media marketing tasks. 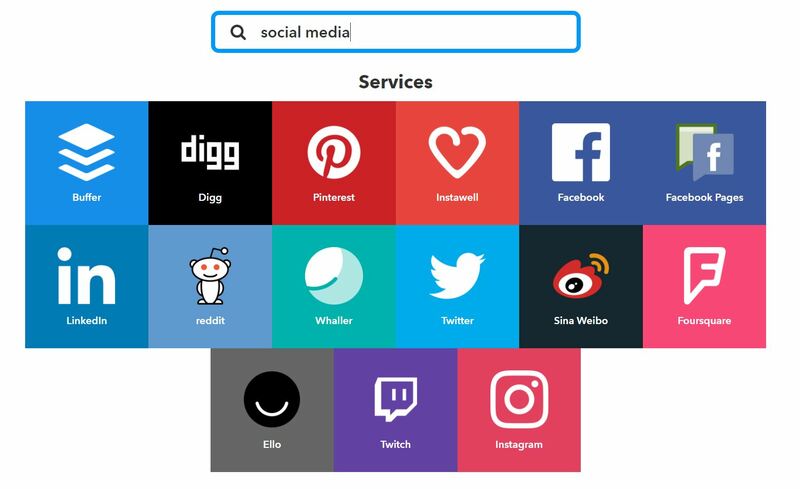 A search for “social media” integrations on IFTTT shows that it can integrate with all the most popular social media sites: Twitter, Facebook, Instagram, Pinterest, LinkedIn… And the list goes on. In this article, I’m going to show you how you can automate three social media marketing tasks through IFTTT integrations. Setting up a new account is as easy as you can imagine. You simply put in your email address, a password, and you’re off! Once you first log in, you’ll see some recommended apps. These are some of the most commonly downloaded apps, but as you use their platform and install apps IFTTT will learn about you and begin to customize this recommendation section. Setting up an already built applet is as easy as clicking on the applet, toggling it on, and providing some details. For example… I sometimes lose my Android phone, and when I go to call it I realize that the volume is off. Wouldn’t it be sweet if there was a way I could remotely turn up the volume? With IFTTT there is a way. I’ll show you as a quick example to illustrate how easy it is to set up your first IFTTT applet. Step 1: Find your applet. 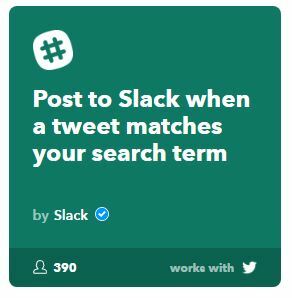 At the top of IFTTT’s website, there is a search field. Click into the search and search for a phrase you think will return what you’re looking for. I typed in “android lost phone” and it returned several applets that would be useful to me. Note: the screenshots I’m sharing below are from my desktop so you can more easily see the workflow. But for the actual applet, I’ve set it up on my Android device, as that is necessary for any Android powered applets. I’m going to use the first search result. In my search results, I saw two that were very similar, but the first one has 180,000 individuals that have used it versus 72,000 for the other. Simply click on the one you want to use, and it’ll take you to the next screen. Step 2: Turn on your applet. Once you’ve pulled up the actual applet screen, read through the description to make sure it is what you really want and then turn it on — simply click the “turn on” toggle. Note: If you’re on a computer with a touchscreen you need to tap on the toggle with your finger, on the screen. IFTTT had the great idea to detect what kind of device you’re on and customize the interface for you. I’m on a Windows Surface, and when I first went to turn on an IFTTT applet with my new device was dumbfounded to find that simply clicking with the trackpad wouldn’t work. Step 3: Customize your applet. On this page, you can edit a few functions of the applet. You can change the first box to be the title of your applet (to show up as you’d like in your account). 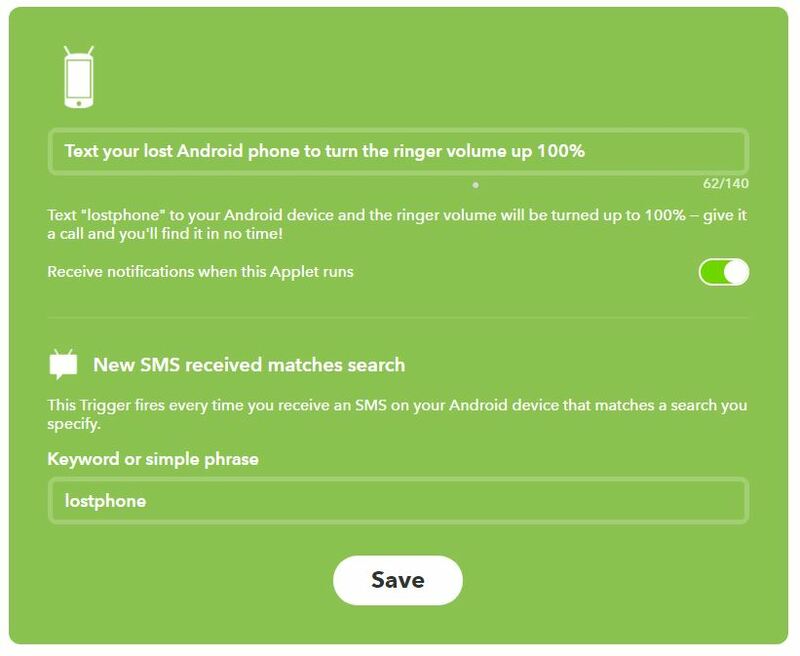 You can toggle on notifications to receive alerts when the applet is run, and you can change the keyword that your phone will receive to turn up the volume. That’s it! You’re up and running! 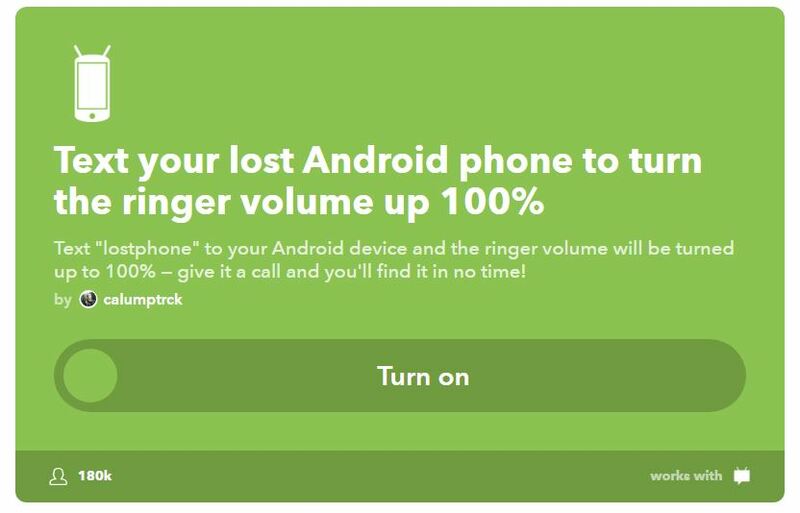 Now go and grab a friends phone, turn your volume down, and send yourself a “lostphone” text to see your volume turn up. There are hundreds, if not thousands, of innovative ways you can apply IFTTT integrations specifically to marketing and sales. Here are just three, in varying complexity (from basic to more complex), that I think every marketer should have set up for their organization. If you are posting content to a blog with any regularity (and you should be! ), then you should also be sharing it out on social media. 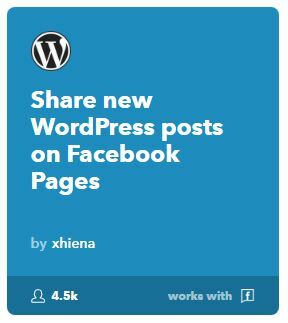 IFTTT has integrations with WordPress, Blogger, Medium and RSS feeds (which means you can use pretty much any blog platform). For the longest time when my content marketing manager wrote a blog post, she would also have to go to Facebook to post the article she had just written. Manual posting is no longer necessary though, as this easy-to-set-up IFTTT applet automates the process! Even though Pinterest has been a somewhat elusive platform for marketers to master, we all know that it has some real potential. What if you could easily share content you like on Pinterest with your Twitter followers? With this simple IFTTT applet, you can. 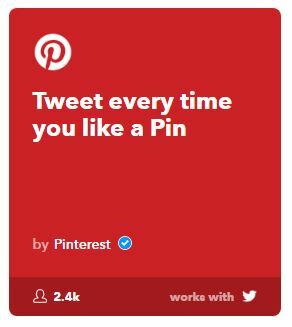 As you surf about Pinterest all you need to do is find a pin that you think would be relevant to your audience and then click to like the pin. It will automatically be shared on Twitter. After you activate the applet be sure to click the little gear at the top right. From there you can customize the message that is sent out in your Tweets. If you’re using this applet a lot, it is a good idea to go into the applet regularly and change up the message so that it doesn’t fill your Twitter timeline with a bunch of posts that look the same. One request I’ve heard time and time again from other executive leaders is whether or not we, in marketing, can watch social media for any mentions of competitor products or other key phrases that may indicate an individual is in buying mode. For the longest time, I’d politely inform them that even my social media manager, who lives on social media, doesn’t have the capacity to always keep a watch for specific keyword mentions. This IFTTT applet is slightly more complex to set up because you need to authorize both Twitter and Slack, and then set a few parameters for it to work properly. However, it is still very simple to set up, requires no programming skills, and can be completed in less than five minutes. If you’re looking to get really advanced with your Twitter keyword search, this help documentation from Twitter will make it so much easier. I hope this article has given you realize the importance of the three applets I shared. Even more than that, though, I hope you’ve come away with a greater desire to expand your marketing automation with IFTTT. What types of ways do you envision using IFTTT at your company?